‘Cohesive’ is not a word you would normally associate with Santigold. Her first three albums have been excitingly eclectic. A confident pick ‘n mix of vibrant and catchy crossover sounds from reggae to hiphop to indie pop to electronic that meant that most music fans would find something to fit their music taste buds, even if they didn’t enjoy all of it. This time around on her fourth record I Don’t Want: The Gold Fire Sessions, the Philadelphia musician is just as confident and rhythmic as before but has decided to narrow her genre focus to dancehall and Afro-Caribbean music. Teaming up with Dancehall maestro Dre Skull (Drake, Wizkid, Popcaan) and collaborating with Jamacian-Korean rapper Shenseea, this wish for cohesiveness could be seen a dangerous career move, potentially alienating people who aren’t really fond of this kind of music. However, Santigold isn’t afraid of taking risks, especially if you note that she was pregnant with twins during album production but was still dedicated to finishing the recordings. She is also being true to herself with this style choice because she grew up listening to Jamaican music when visiting the country every year during her teens. Originally released digitally in the summer and only now out for physical release, listening to I Don’t Want: The Goldfire Sessions sounds like stumbling upon Roots FM on a car journey on the way to the Notting Hill Carnival. This is not just because of the Caribbean music influence and hot seasonal vibe but because it’s a mixtape with short tracks that blend into each other and are bridged together by air horns, sirens, lazers, whistles and elevating bubbles, amongst other radio DJ-associated buttons. It’s just short of radio presenter enthusiastic announcements to complete that atmosphere. The record title has the suffix The Gold Fire Sessions because Santigold wished to create an album with Dre Skull with a rapid production time. The promotion of the record was also pretty fast, having only been announced 6 days prior with a self-posted cryptic twitter message. Despite the spontaneity and rushed time scale, the record still contains some interesting moments of Santigold-like commentary, just as powerful as on ‘Can’t Get Enough of Myself’ on her previous release 90cc. ‘Run The Road’ strips away the supposed glamour of touring with confessional lines such as: “From on this side it seems like a wall. Rough ride, get me through it some way. Another long flight, make me earn the pay. ‘Coo Coo Coo’ is a f-you to catcallers. While, ‘Crashing Your Party’ is about ignorance towards society’s more important issues and contains the all-too-true lyric: “Don’t dream of nothing big, just dream of vacation”. Recently in an interview, she discussed her disappointment at how we treat our planet and ignore the consequences. 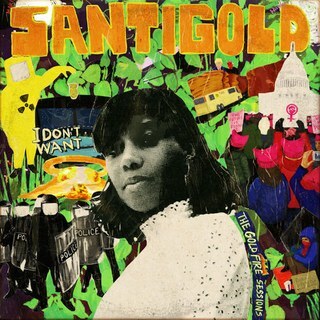 However, the most important lines could be on the title track ‘I Don’t Want’ in which Santigold stands her ground, controlling her own independent definition of success, stating: “I don’t want to be the best. I don’t want to be a fast talkin’ millionaire. I don’t want no regrets. Wasting my time, not saying what I meant. Don’t want to be a fake”. Although her new record might not appeal to everyone, her confidence and self-respect is something that is admirable and cohesive throughout her catalogue.